Daniel and Sylvia Calderon are precious friends to many of us. Untold thousands have been ministered to by this loving couple. And now, due to Daniel’s physical problems, in the natural, the two of them are standing at a door. It could possibly be death’s door. At the time, we were planning our first AMI Gathering (Labor Day Weekend, 2012), and we thought the dream meant that we would be going through a “spiritual door” and moving into a new place spiritually. But after the Gathering, even though we were greatly blessed and made spiritual progress, we felt there was something more. Now, I think that something more has to do with all of us successfully praying for Daniel and Sylvia. Daniel Calderon is a faithful, born-again son of God Most High. He belongs to the Holy One of Israel. And he desperately needs our help. However, as someone who has needed the prayer of the Body of Messiah (and thankfully received it), I want to share a few things that I observed along the way that have to do with prayer. I imagine healing prayers as being like water that flows through one person to get to another. That means, if our “spiritual pipes” are clogged in any way, if they are filled with junk, our prayers will flow over that junk and come out “contaminated.” For example, if we are filled with self-righteousness, the one we are praying for might feel condemned, especially in their weakened condition, and our attitude might hinder their ability to receive healing. Moreover, if our spiritual pipes are contaminated with pride, the last thing the Father would want to do is to use us to heal someone, because we would get puffed up with even more pride. We therefore need to “check our pipes.” We need to ask the Ruach if we have any hidden motives that might hinder the success of our prayers. It has also been my experience that people can make people feel bad when they pray for them if the sick party does not “receive their healing.” This puts the weak one on a guilt trip. In these verses it is the elders who are offering a prayer of faith, so if anyone were guilty (and that is not to say that they are), it would be the elders and not the one who called for help. We should not make sick people feel guilty when a prayer is not answered. We instead need to find out how we missed it with our prayer. Yeshua said, “The Son can do nothing of Himself, unless it is something He sees the Father doing; for whatever the Father does, these things the Son also does in like manner” (John 5:19). Similarly, if we first pray and ask the Father how we ought to pray in any given situation, we would surely have greater success. If we “see” the Father doing it, we can know that it will work for us. The Holy Spirit will help us if we but ask. “The Spirit also helps our weakness; for we do not know how to pray as we should, but the Spirit Himself intercedes for us with groanings too deep for words” (Rom 8:26). It is easy for us to “blame” the failure for unfulfilled prayer on the sick person, because most of us have been raised with the idea that the presence of sickness is a sign of sin in the person’s life. On one level this is probably so, because “all have sinned and fall short of the glory of God” (Rom 3:23). All of us have missed the mark in some way. It may be that the person who needs prayer needs to be encouraged to make changes, so the problem doesn’t return. Once we are healed and/or delivered, we need to leave our life of sin and clean our house, we need to wash it with the water of the Word so that the demons will not have a place to which they can return (Mat 12:45; John 8:11). Once, after seeing a blind man, Yeshua’s disciples asked, “Rabbi, who sinned, this man or his parents, that he was born blind?” Yeshua replied, “Neither this man nor his parents sinned, but this happened so that the work of God might be displayed in his life” (John 9:1-3). We also need to be careful about giving advice to others if we do not have actual experience in the area. We are called to be “witnesses,” and in a strict sense that means to have “firsthand knowledge.” If our advice is based on what we have read about or been told, let us be humble in submitting it-and beware any hints of wrongful judgment because they have a problem. If we judge them harshly, Abba may decide that we need to have a similar experience. Seeing people be healed and delivered in life is a gift from above. It is a beautiful opportunity to see our God at work and thus to be greatly encouraged in our faith. For that reason, we need to take every opportunity to carefully pray for one another. For, we serve a Messiah whose Gospel was filled with deliverance and healing, and He told us to go and do likewise. Friends, we now have a Golden Door of Opportunity before us. We have a beloved brother who needs healing in the Name of our Messiah, Yeshua. We have a noble brother and sister who need to be lifted up on High, who need to be comforted and strengthened in this hour. Let us therefore come together and ask the Father to clean our pipes. Let us ask Him to send us His Spirit and grant us the wisdom to know how to effectively pray in this situation. 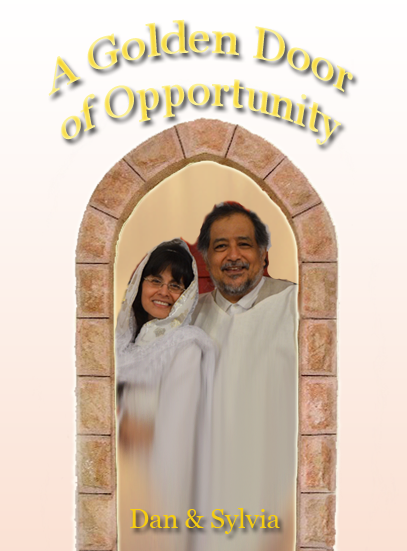 Let us ask Him to please allow us to go through this Golden Door of Opportunity with Daniel and Sylvia Calderon. This entry was posted	on Saturday, February 2nd, 2013 at 4:39 pm	and is filed under Prayer Requests, Comments, and Teachings. You can follow any responses to this entry through the RSS 2.0 feed. Both comments and pings are currently closed.